The partners of the London Health Board, including the Mayor, NHS, local authorities and Public Health England, came together on 21 October to publish Better Health for London: One Year On. 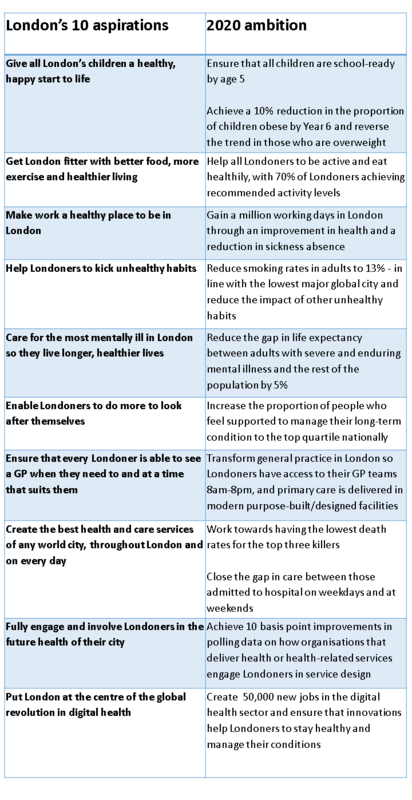 The report is a progress check on what organisations across London are doing to improve health and health care in relation to the 10 ambitions set out a year ago in the London Health Commission report Better Health for London. The ultimate ambition, of course, is to make London the healthiest major global city in the world and this is no mean feat as our animated video on the State of Health in London illustrates. London has a number of ticking time bombs that are going to cause big problems for the future if we don't get under them now, childhood obesity in particular. The proportion of our children who are overweight or obese - 37% of 11 years old - is the highest of any major city in the world and, with over 50% of adults also overweight and at risk of diabetes, we need to battle hard if we are to change this upward trend and avert an obesity crisis, and all the ill health that comes with it. We need to get serious about prevention and it needs to be at the forefront of everything we do. Cooperation across the system is crucial for this and is a key ingredient for change. We need to come at this from all angles, with at-scale upstream measures shaping our food environment and at a personal level with individual behaviour change. Fortunately there is real commitment to this across London and we need to build further momentum over the coming months to get Londoners eating more healthily and becoming more active. The State of Health in London video was created as a way to connect with Londoners and wider stakeholders and it invites individuals to make a pledge on how they are going to personally get healthy. You have probably now seen PHE’s report Sugar reduction: the evidence for action. The view from this is that there is no silver bullet solution to the nation’s bad sugar habit and that a broad and balanced approach is our best chance of reducing sugar consumption to healthier levels and to see fewer people suffering the consequences of too much sugar in the diet. London partners will be looking forward to the publication of the Government’s upcoming obesity strategy and, as a city, will want to lead the way where it can. We are already making good progress with local and pan-London initiatives to target obesity and key achievements highlighted in the report are set out below. Are they working? Time will tell. Change must be delivered in a phased approach and is often developed by one partner and handed to the next. In many ways we are developing the evidence as we go along and must be prepared to try things out and learn as part of the process. We need to build the evidence base more formally as well with research that informs future practice, and that needs funding. Another question is who pays for prevention? Where is the money going to come from? We need the resource to plough into prevention if we are to reap its benefits in future healthcare savings. Maybe we just need to get our thinking into a different place about how we might garner the resource for prevention. Investing £1.2m to use a whole-systems approach to food, two Food Flagship Boroughs aim to change the food environment across the two boroughs of Croydon and Lambeth – making good, healthy, sustainable food the norm and significantly reduce child obesity rates and incidence of adult type 2 diabetes. Transport for London’s ‘Transport Action Plan’ is investing £4bn over 10 years to make our streets greener, safer and more inviting to pedestrians, cyclists and public transport users. 192 organisations in the capital employing almost 200,000 people have already signed up to the Mayor’s Healthy Workplace Charter, which encourages employers to support the health and wellbeing of staff. This includes eight NHS trusts employing almost 60,000 people. The Mayor’s Sporting Legacy programme is supporting London’s promise of an Olympic legacy by investing £22.5m in projects across every London borough and creating hundreds of thousands of opportunities for Londoners to get into sport.